On a new "Musings from the High Desert," Fr. Gabriel Rochelle, priest at St. Anthony of the Desert Orthodox Mission in Las Cruces, New Mexico, examines the theology and texts that came before St. Paul in order to prove that he was an inheritor and not an inventor of the Christian faith. 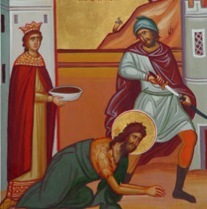 The Feast Day of the Beheading of St. John the Baptist is on August 29. Fr. 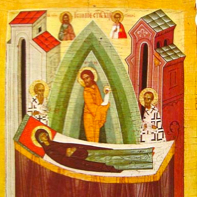 Thomas Hopko, Dean Emeritus of St. Vladimir's Orthodox Theological Seminary, examines the Prophet, Forerunner, and Baptizer John. This is part one. Part two can be found HERE. On last night's episode of "Ancient Faith Today," host Kevin Allen interviewed Veronica Hughes, author of The Pearl of Great Price: The Spiritual Journey of a New Age Seeker to the Light of Christ and the Eastern Orthodox Church, about the very serious problems with New Age beliefs. On a new "Frederica Here and Now," Frederica Mathewes-Green explains to non-liturgical Christians why the actions of the recently convicted Russian protest group were sacrilege and especially insensitive to the Orthodox individuals who remained faithful throughout the Soviet era. Listen to the daily scripture readings and thoughtful commentary with quotes from the Fathers and the lives of the Saints. It's strength for the journey, heard whenever you wish from your computer or portable device. Hosted by Fr. Tom Soroka. Thanks to a number of small donations—and one giant donation—we now have the money to purchase a new computer for our streaming talk station! We are so grateful for our loyal listeners and their seemingly boundless generosity. Thanks again! On a new "Musings from the High Desert," Fr. Gabriel Rochelle explores a number of different facets of the thought and writings of St. Maximus the Confessor, which he compares to the facets on a diamond that shine as you turn the stone. Programs Director Mark Ohanian gives us an update on war-torn Syria and the humanitarian aid being given by IOCC (International Orthodox Christian Charities) in cooperation with the Department of Ecumenical Relations and Development (DERD) at the Greek Orthodox Patriarchate of Antioch and All the East (GOPA). In part 34 of his series on bishops, Fr. Thomas Hopko explains that St. Symeon the New Theologian holds great importance for Church hierarchy and structure because of his teaching on the relationship between the clergy and the holy monastics. Ancient Faith Radio is pleased to present our growing slate of long-form documentaries on a wide variety of topics related to the Orthodox Church. Listen here as AFR correspondent Chrysanthe Loizos takes us "behind the scenes" at the Orthodox Monastery of the Transfiguration in Ellwood City, PA.
On August 15, the Church celebrates the Dormition of the Mother of God. Fr. Tom Hopko explores the theology associated with this Feast and the implications for our own resurrection. Recently Fr. Thomas Hopko visited and spoke at the well known and evangelical based Wheaton College. While he appreciated and was honored by the opportunity, it caused him to reflect on the evangelical movement from an Orthodox Christian perspective. His thoughts will be of value to Orthodox and Evangelicals alike.